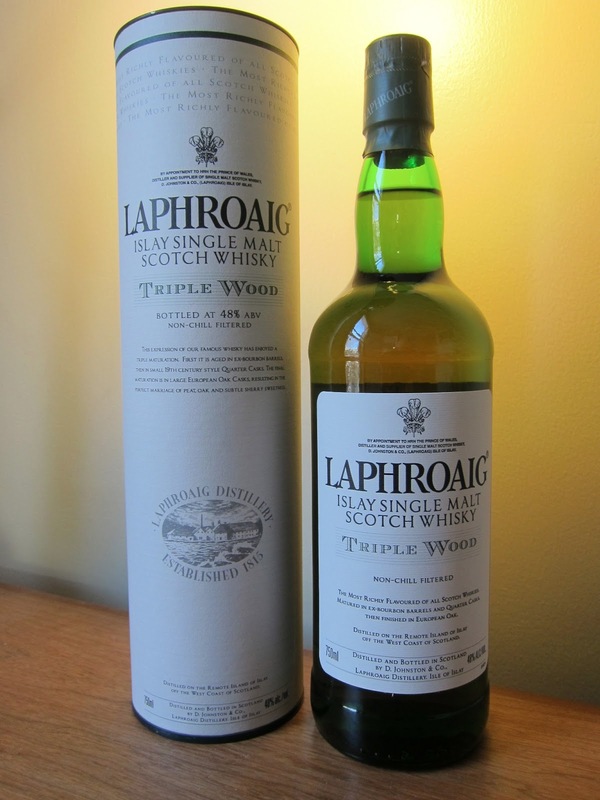 Laphroaig Triple Wood (48.0%): It has been almost one and half years since I posted the tasting notes of Laphroaig Triple Wood on this blog. That bottle was the travel retail only release back then. Basically the whisky is the standard Quarter Cask expression transferred for one year to first fill and for two years to second fill European oak Oloroso sherry casks and then married together. I wonder if anything has changed after they started to distribute the expression world wide. Color: Bright and clear gold. Shines like a cask aged Chardonnay. Nose: Damp cardboard boxes, glossy magazine pages, piles of old National Geographic Magazine copies my father used to save throughout the 70's and 80's for no practical reason. Banana cream pie and fresh hazelnut skins. Mothballs, wet sand and bonfire at the beach still smoking the morning after. A few drops of water brings rubbery and grassy aromas; dried wild grass, party balloons and old eraser rubber. Palate: Hotter, peatier and saltier than I remember. If I am not totally making this up it definitely tastes less sweet than the earlier release. I think I like it more now. Pretty grassy with dying turf and hay. Memories of scraping the remains of a slightly burned and caramelized upside down apple skillet pie. Dusty and ashy... Water adds some sweetness but not even close as I remember. More like a touch of salted caramel, vanilla pods and roasted cocoa nibs. Finish: Long and sizzling hot. Cracked pepper corns, coal ash and butane lighter. Overall: Ok, maybe it is odd but here is what I think: I am not sure if the whisky or my palate has changed but I didn't get those strong sweet notes from European oak Oloroso casks like I did before. Maybe more second fill sherry butts in the vat? I don't know but I definitely like it more now... I wish I had some drops left from my duty free bottle to compare with. Anyway, it's a great after dinner dram. I am pairing it right now with a rich hazelnut milk chocolate bar and they go amazingly well together. Thanks again to Simon Brooking for the sample.